I’ve had a marvellous weekend of minor triumphs. 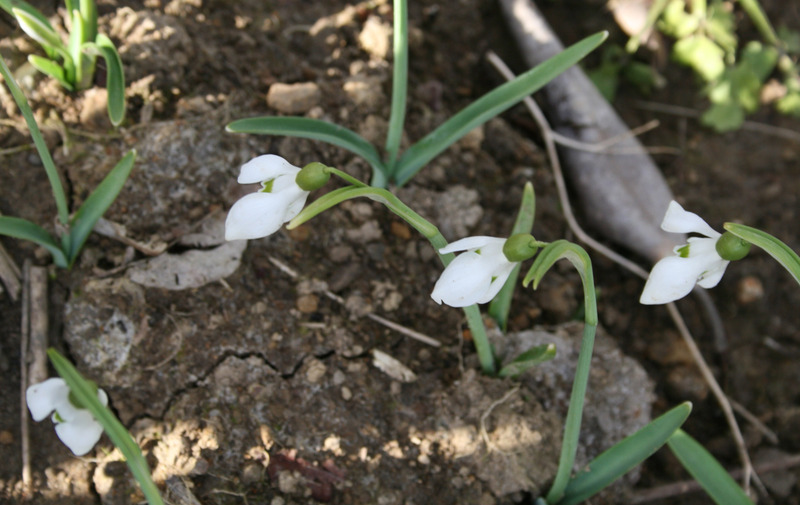 First, my snowdrops (Galanthus nivalis) started flowering. Given that I only got the bulbs into the ground six weeks ago (and when I say “I”, I really mean my husband’s cousin’s wife Nicki, who has been helping me catch up on all the gardening chores I missed in the weeks before, and the weeks after, Lucas was born). But I can’t really skite as they’re the saddest little snowdrops you could ever see. Each bulb has each sent up two chive-sized leaves and a wee flower on a 10cm high stalk. I picked a few to take a photo of but I couldn’t find a vase small enough to do them justice. Ah well, next winter they’ll be fabulous – and fully sized too, I hope. This weekend also marked a major milestone in Lucas’ life. We discovered that, if we push him in his stroller to the end of the driveway and back, and then along the gravel path through the paddock and around the old equestrian arena and then up the hill past the chickens and around the horse chestnut tree to the end of the lawn and back (repeat as necessary), he’ll happily sleep for a couple of hours, parked up on the lawn, while his parents dig, sow and plant like crazy. Consequently, we made a fair bit of progress, in between feeding, changing, burping and, our current favourite pastime, behaving like a couple of middle-aged dorks to get a gummy grin (or 20) from our little man. Seeds sown this weekend: Angelica pachycarpa (this glossy-leafed species isn’t edible but is very pretty in the garden), a packet of ‘Romanesco’ Florence fennel, giant red mustard, sorghum (I found a packet from Koanga Seeds that must be at least three years old so I’m not sure if the seeds are still viable, but what have I got to lose? ), Nasturtium ‘Empress of India’ (I’ve sown the seeds direct, between my ‘Bright Lights’ silverbeet seedlings), a row of ‘Onward’ climbing peas, a packet of old-fashioned fragrant sweet peas, Chinese broccoli (kailaan), honeywort, Salvia ‘Turkistan White’ and Orlaya ‘White Lace‘. Flower seedlings transplanted: 1 row of Oriental poppies, 1 row of ‘Strawberry Parfait’ dianthus, 1 row of the dwarf double Sweet William ‘Pinocchio’ (available in garden centres in punnets). At least you’re not out driving him around in the car, and just think of the exercise you are getting! VBG! I bet he is just gorgeous. I am biased towards boy babies after having 3 of my own! The car is the last resort. He usually falls asleep just looking at the car seat 🙂 It’s weird how the motion of driving knocks them out so effectively. Shame they usually wake up as soon as the engine’s turned off! I’m sure you’ve been told before (we older gardeners like to flaunt how knowedgeable we are!) that parsnips like cool conditions to germinate (Sept-Oct our choice here in BOP, and sown directly into the garden) and take at least 3 weeks to show their faces! We have always poured boilng water over the newly-sown row to soften the hard seed shells, a trick learnt from our parents. We’ve been doing it successfully for 50 years! Love to hear the news about your wee man as well as the garden. You will find an old wooden playpen very useful when he starts to crawl and you want to garden. If you have more chldren you will find it so much easier-two do not take any more time than one and when , if you should get to four, as I did- its a piece of cake!! Parsnips took so long I gave up- and dug them in only to find two popped up several months after. I have put in lettuce,spring onions and carrots as we are frost free in our garden in South Head. Also put in a pot in the sun coriander and basil seeds. Snowdrops always remind me powerfully of my English childhood, but it is hard to grow bulbs in our dreadful clay soil. I picked a handful recently while walking our dog in a street. They had spilled from several gardens into the public preserve, so I didn’t deprive any gardener of more than a few each. Later on, though, I was so glad I had, because my husband came home and spotted them in a vase. He had never seen snowdrops before and he was instantly smitten by their delicately hanging heads and contrasting strip of green. He pronounced them “a perfect Art Deco flower” which is high praise indeed! I am very sorry this is completely off topic. I watched both Get Growing series and in one of the episodes you gave the family a small backyard beehive to have on their property. I would like to get one and can not find where I can get one from. Can you help me out please?? Thanks heaps!!! PS i really enjoy reading your blog updates and your column in the NZ Gardener mag. It was a bumblebee hive – we got it from http://www.zonda.net.nz. They’re designed for glasshouses (so you’ll need to build a little box to put the hive in) and they need replacing every few months. It’s pretty cool for pollination though. Best of luck! Will my tomatoes do fine in a 30cm depth? With it being container planting effectively is crop rotation still really important as you showed in your show or could I plant different things together? Do you know what is best to plant together or what really don’t do well together? Last year I planted strawberries, but now their leaves have all gone brown, does this mean they are dead? Or will they grow again if I cut the brown bits off? Sorry for all the questions, your help would be very much appreciated! Sorry for the late reply – your comment ended up in the spam folder. 30cm is plenty deep for tomatoes, though you’ll may need to stake them with tepees, rather than single stakes, as the stakes might rock about a bit if they’re just in potting mix. Keep them well fed and they’ll be fine. My advice would be to line your garden boxes with 5cm gravel (to improve drainage), and then a layer of permeable weedmat (to stop the soil washing out the bottom). Don’t worry about crop rotation – that’s really a theory for gardening long-term in the same soil, whereas you’ll need to just make the best use of the space you have (and you’ll no doubt be using a mix of potting mix, compost, mulch etc, rather than dirt). Plant as close as you like (you can often get away with halving the spacing recommended on the seed packet or punnet label, provided you keep your plot well watered and fed). A couple of tips: put the tall plants at the back of the box, so they don’t cast a shadow over everything else. Sow baby carrot varieties (they’re quicker and better in shallow soil) and dwarf peas. And plant the strawberries right on the edge, so the fruit can hang over the side (saves space & makes them ripen more quickly). The old leaves will be looking a bit shabby by now – just snip them off and new leaves will grow. Sow mesclun salad mix in any gaps too – it’s quick and delicious (ready to pick as baby salad greens in 3-4 weeks through spring and summer). Best of luck! It’ll not be long till you can train Lucas up to help with the weeding. I long for that day to come, my oldest is 5 and spends less time in the garden with me the older he gets. hahah.. oh well .. i have another to try and train! At this point, Lucas’ main role in the garden is to wake up and demand feeding just as I get down to planting anything! Makes for slow progress, but also makes for speedy sowing. It’s amazing how much you can get done in 30 minutes! My daffs are looking pretty good too, considering they weren’t planted till July. I’ve got a bunch of diferent varieties, from white-with-orange-corollas to ruffled yellow and orange ones and a double white one. I’d love to have drifts in the paddocks here… one of joys of growing up in the country is admiring other people’s daffs, en masse, in sheep paddocks. Looking at your snowdrops, they are totally different to the ones I have had for years. Mine have 6 perfect petals ,that form a beautiful bell shape. On the tip of each petal is a small green spot.The flower would be approximately 1cm round and the same from stalk to tip of petal. There are 6 little golden stamens.Up to 3 or 4 flowers form on each stalk. My, how Lucas has grown, and it sounds like he has you wrapped around his little finger going on that long ,bumpy walk. Good execise for you !!! It certainly has been a late and COLD winter. Till later, take care of each other, and enjoy your little man. My fresias, daffodils, anaemones,renunculas,violets,ixias,and muscari etc are all in flower.—– I love spring. 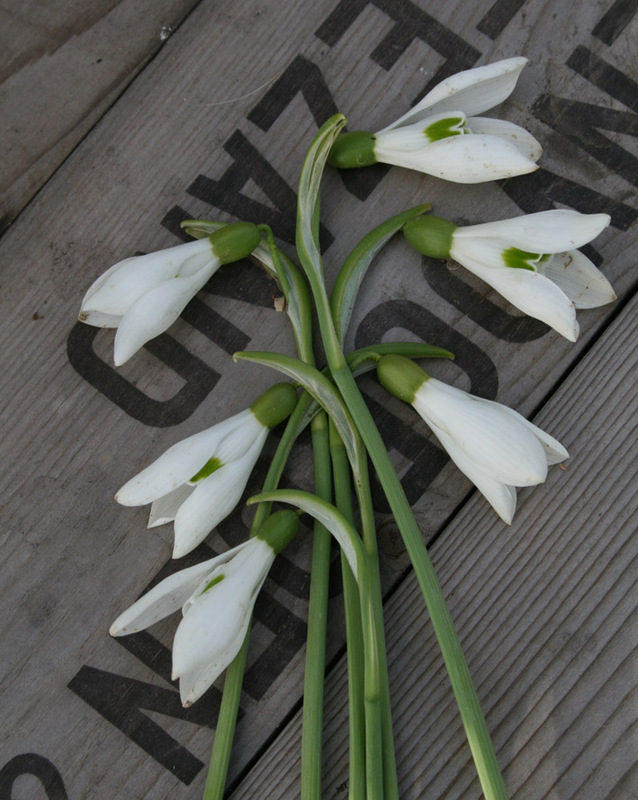 My snowdrops are not as they should be – they’re very stunted, hence they lack that bell shape. Next year they should be fine, but this year I planted the bulbs far too late. Lucas has grown – he’s quite the little man now. My freesias are a long way off flowering, but hopefully they’ll get there. In the past week I have seen at least 15 flowering Pohutukawa tree’s. One by the board walk at Warkworth, And a couple around the Treaty House at Waitangi. And places in between. Bring on summer, that’s all I can say! Thanks for the link Kali – at this point none of the sorghum seeds have germinated so I might not need to know how to process the stalks later on!